Spend the Holiday season with glittering, shimmering, ravishing color in the Let It Snow Collection from China Glaze—launching September 2011! Los Angeles, CA –(July 2011): Spend the holidays in style with the new Let It Snow collection from China Glaze! Introducing 12 festive shades sure to get any girl in the holiday spirit this season. Specifically created with the wintery season in mind, Let It Snow will have even the biggest Grinch feeling jolly all winter long. Not only a must-have for a holiday manicures and pedicures, Let it Snow is available in 12 seasonal inspired gift sets perfect for stocking stuffers, Hanukah gifts, Secret Santa, co-workers and Teacher’s gifts. 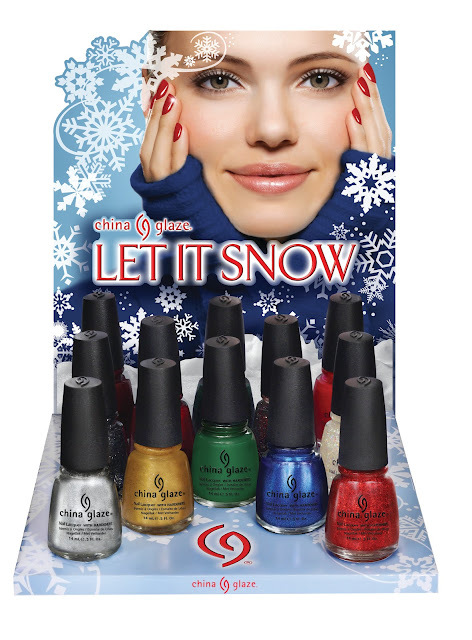 China Glaze Let It Snow collection will be available at fine salons and professional beauty supply stores nationwide!" · Poinsettia – Ruby red crème inspired by the traditional holiday plant. · Ring In The Red – No Holiday season would be exact without this glittering red polish for holiday gatherings. · Winter Berry – Creamy, cranberry-red perfect for sipping hot cocoa by the fire. · Velvet Bow – Rich red crème color inspired by your favorite red wine. · Glittering Garland – A dazzling glittery green to match the holiday greens of pine trees, garland, and mistletoe. · Holly-Day – Looking for a bold color without the glitz? Holly-Day is a rich hunter green without the sparkle. · Champagne Bubbles – Sophisticated gold metallic with a golden shimmer. · Twinkle Lights – A mix of glittery shades to emblemize twinkling tree lights. · Snow Globe – Frosty white polish with flecks of snowy color. · Icicle – Smooth silver shimmer with a hint of flash and ice. · Tinsel Town – Bold silver, metallic glitter and the perfect match for sparkling night on the town. · Blue Year’s Eve – Ring in the New Year with this lustrous, shimmering blue. · Belle Of The Ball: Champagne Bubbles and Tinsel Town with a Festive Ornament. · Seasonal Sparkles: Poinsettia, Twinkle Lights and Holly-Day. · Meet Me Under the Mistletoe: Ring In The Red, Velvet Bow and Glittering Garland with Lip Lacquer. · Santa’s Little Helpers: Ring In The Red, Holly-Day, Twinkle Lights and Velvet Bow. · Let It Snow: Blue Year’s Eve and Snow Globe with a Mini Snow Globe. · Holiday Spirits: Icicle, Champagne Bubbles and Glittering Garland with a Pewter Bottle Stopper. · Berry Sweet: Velvet Bow and Ring In The Red with a Holiday Berry Moisturizing Lotion. · Baby It’s Cold Outside: Icicle, Blue Year’s Eve and Poinsettia with Fingerless Gloves. · Deck The Halls: Glittering Garland and Champagne Bubbles with Limited Edition Holiday Berry Cuticle Oil. · Winter Ice: Blue Year’s Eve, Tinsel Town, Icicle and Snow Globe with a Snowflake Charm Necklace. · Holly Bear-y: Holly-Day and Winter Berry with “Holly Bear” Plush. · Carry Me Away For The Holidays: Tinsel Town, Poinsettia, Velvet Bow and Icicle with a Manicure Carrying Case with Nail File. Galahad again...this time with flakies!